Some of the Medlar Angling Classics were originally issued as paperbacks, but the format never really worked, largely because books of this kind of quality just don’t feel right with limp covers - the new format is much more satisfying, with a plain, but attractive design and hard covers that you can rap with your knuckles - these are books that will last, despite the price. After a few years as a lecturer, Canaway became a professional writer, his output including, among other things, the screenplay for the Ipcress File, so it isn’t surprising that he managed to turn out as pleasing a book about fishing as this one. 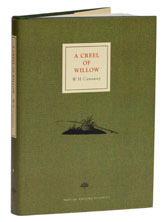 A Creel of Willow is the most delightful series of stories about a fly fisherman’s love affair with the river Withy, his encounters with the people who fished it and about the fishing, although like all good books, the river is as much a frame for the characters as anything else. No, it doesn’t quite have the quality of A Summer on the Test, or even of An Angler at Large, but it is still a damned good book.